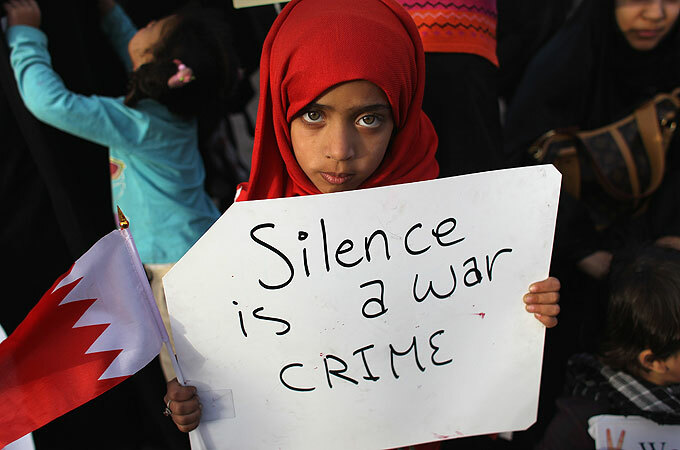 Libya is not the only Arabic revolution where outside forces have intervened; there are also foreign troops in Bahrain. Occupying forces from Saudi Arabia and the UAE are helping the monarchy put down a rebellion with only a few hypocritical murmurs from the West and no sign of UN-sponsored intervention in the rebels’ favour. With martial law in place after two months of protests, Bahrain has today brushed off a Kuwaiti offer to mediate with the rebels saying it wasn’t necessary. The al-Khalifa regime is set on a path of destroying the opposition while the rest of the world is too distracted by events in Libya to do anything about it. The Sunni Al Khalifa tribe has ruled Bahrain for almost 200 years, a rule cemented by British overlords and trade-based wealth in the 1800s. The majority Shia remained second class citizens despite the implicit and sometimes explicit support of Iran. The discovery of oil ensured British meddling would continue for much of the 20th century. Britain and Iran’s struggle for supremacy continued until Bahrain gained full independence in 1971. A 1973 constitution promised free elections (for men only) but this was thrown out two years later by emir Salman al Khalifa. In the 1990s opposition forces demanded reforms from the ageing emir and a return to the 1973 constitution. For six years the streets were plagued with riots which were suppressed by the regime. The intifada did not end until the death of Salman in March 1999. Hamad bin Isa Al-Khalifa succeeded his father and promised to carry out political reforms. On 14 February 2001 a referendum to carry out the National Action Charter to return the country to constitutional rule was overwhelming supported by 98.4 percent of the voters. The 2000s saw the enfranchisement of women and parliamentary elections in 2006 and 2010. However, key problems remain including discrimination against the Shia and the all pervasive power of the al Khalifa caste. Power sharing was thrown firmly into the spotlight after pro-democracy demonstrations in Tunisia and Egypt hit the headlines in January. Bahrain’s opposition was mobilised to demonstrate on the 10th anniversary of the National Action Charter on 14 February. Manama’s Pearl Square became the epicentre of resistance with protesters calling for political reform and equalisation of the economic benefits of Bahrain’s oil-rich economy. The reaction from the alarmed administration was swift. On 17 February a pre-dawn tank raid on the square killed five and injured 230 others. Soldiers placed roadblocks and barbed wire around the centre of town and leaders banned public gatherings.Talk of reform was replaced by talk of overthrow of the hated al Khalifas. The funerals of the dead turned into shrines of martyrdom with 100,000 people on the streets – one eighth of the country’s population. Opposition unity was marred by sectarian clashes between Sunni and Shia. The panicky leadership made concessions by sacking extremist ministers while still authorising a shoot to kill policy on the streets. On 14 March, the Emir called for help from Sunni allies. Led by Saudi Arabia they answered the call. A thousand Saudi troops and 500 UAE police officers crossed the bridge to Manama. They were part of a deployment by the Gulf Co-operation Council, a six-nation regional grouping of Bahrain, Saudi Arabia, Kuwait, Oman, Qatar and UAE. The force protected the oil and gas plants and financial institutions. According to al-Khalifa, the troops were there “to look at ways to help them to defuse the tension in Bahrain.” But this was an occupation force to crush the revolution. Hillary Clinton said Bahrain and its GCC allies were “on the wrong track” but mentioned nothing about the 5th fleet in its Bahrain base protecting US oil wealth in the region. The Khalifas may not be loved by their subjects but the White House knows a Shia government in Manama would not want 4500 US military personnel in the city. The Fifth Fleet is not there to create disorder but to preserve it. When the regime does fall, as it inevitably will, the American can have no complaints when they are kicked out. As expected for almost four years, the Liberals have regained power in NSW for the first time since 1995. It was a victory obvious since a day after the last election four years ago when the state had enough of Labor but weren’t quite ready to trust the other lot. Labor were always going to lose today, as long as the opposition leader didn’t have any sexual peccadilloes to be exposed. NSW’s incoming premier Barry O’Farrell has no skeletons in his closet, and was content to stay in that closet while Labor destroyed itself. Premier Maurice Iemma survived the 2007 election not because he was competent but because the well-liked John Brogden couldn’t control his tongue. Brogden’s successor Peter Debnam was inept in the election campaign. Barry O’Farrell was deputy leader under Brogden and favourite to replace him. Debnam outmanoeuvred him in 2005 but fell on his own sword after the 2007 election. O’Farrell is Irish stock, conservative, canny and pragmatic to a fault. He knew that to win the 2011 election he simply had to not put a foot wrong. This meant letting Labor hang itself with the help of media. Under O’Farrell the Liberals quickly established a lead in the polls. Iemma quit a year after winning and his replacement Nathan Rees was a dead man walking. Leading the state during the GFC didn’t help as revenues shrunk and three by-elections resulted in massive defeat. Rees had even less gravitas than Iemma and both were compared unfavourably to party hero Bob Carr. Some critics wanted to fast-forward the election and criticised the state’s mandatory four year terms. As Antony Green pointed out, this was nonsense. The Rees government would have been highly unlikely to call an election until the last possible date because opinion polls indicate it couldn’t win. What the fixed term did was to mark 26 March 2011 on the calendar as a day of retribution. Whoever was Labor leader on that day would pay for 16 years of apparent ineptitude. NSW ranks last in state economies. Given that it remains the state with the biggest population and Australia’s biggest and only international city, it rankled with status-conscious locals. Despite NSW unemployment is now falling the damage was done. Kristina Keneally was drafted in to replace the increasingly exposed Rees. Her enthusiasm and American glamour made her personally popular but she was unable to stop the inevitable bloodbath. The result was as expected with O’Farrell’s coalition likely to win 68 seats to Labor’s 22. It is a defeat likely to keep it out of power for 12 to 16 years. While Labor retreats to nurse its wounds, O’Farrell will now have to step out of the shadows. As David Marr said in 2009 O’Farrell was determined but cautious. “He commits no blunders.” Marr also called him one of the most capable apparatchiks the party has produced in a generation. In 1992 he defeated Tony Abbott to become State Director of NSW Liberals. Long content to be a backroom boy he told people “when I lose weight and the beard, then you’ll know I’m after the Liberal leadership.” In 2001 the beard went and he started weight loss programs two years later as Brogden’s deputy. 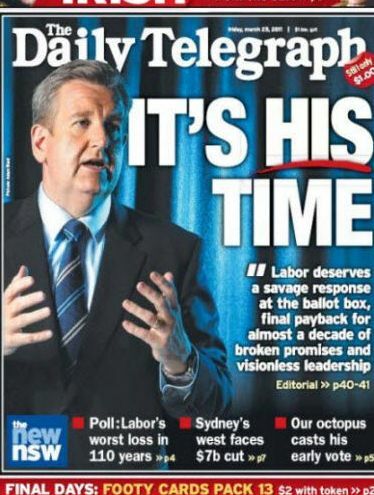 Marr said O’Farrell’s failure to replace Brogden in 2005 “haunts his career”. As he celebrates being the first Liberal premier of NSW in over 17 years, perhaps now he can forget his old nightmares. The serious question remains however, can he help NSW forget its? I have a story in tomorrow’s paper that made me angry I had to write it at all.This time last year, Roma and western Queensland had a major flood. There was substantial damage to homes and livelihoods, though no one died. 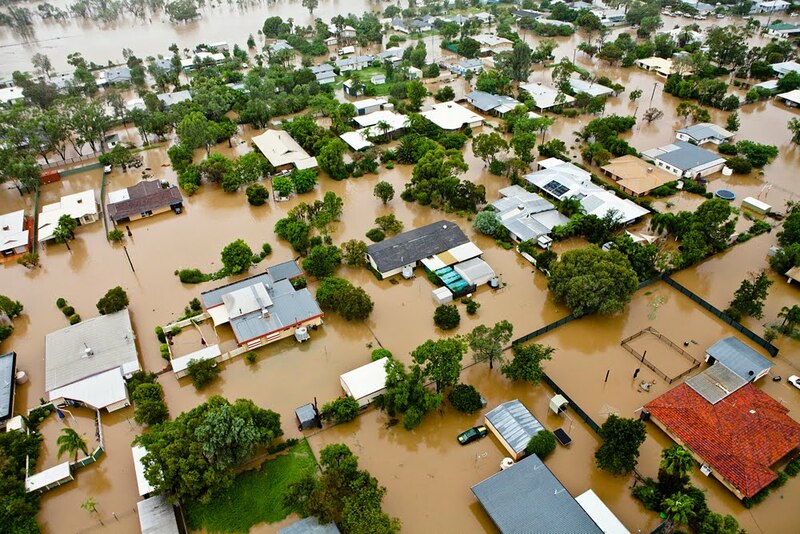 The floods wreaked havoc as they would later do in eastern Queensland in December 2010 and January 2011. There was the initial heartbreak of water in houses destroying prize possessions and priceless memories. Then later, many residents found they had been dealt a double blow. Insurance companies sent out pennypinching assessors with unwritten orders not to pay out and used every mean trick to deny claims. In South West Queensland hundreds of residents had claims refused after the March 2010 event; in South East Queensland, thousands ended up in the same leaky boat. NRMA, NAB (and underwriters Allianz) and ANZ (underwritten by QBE) paid hydrologists to make findings that suited the companies. It was “Sunny Day Flooding” which wasn’t covered according to the small print, and not stormwater damage which was. Independent hydrology reports said exactly the opposite. When Roma, St George and Bollon residents found out insurers had abandoned them, they had two choices: involve the Financial Ombudsman Service or join a class action to fight the companies. There were a few small and remote voices (the Western Star was one) who complained long and hard about the insurers but they were of no concern to multi-national companies with shareholders to look after. 1) Is the Courier-Mail “Sunny Day Flooding” report accurate and has the NAB put aside a large amount of money to cover Brisbane and Toowoomba flood victims who may be under insured? 2) If so, are there any plans to extend these payments to flood victims of the Western Qld floods of March 2010? 3) If there are no such plans, how does the bank justify helping out those in urban areas while not extending the same courtesy to its rural customers who suffered just as much in a similar fashion, but at a different time and with less national media exposure? The response did not answer my questions directly but more or less confirmed question 1 was true. Questions 2 and 3 weren’t addressed. Instead I got managerial language and a brush off. I responded again on Tuesday: “You didn’t address my questions 2 and 3 so I will take this to mean that NAB has no intention of helping out its rural customers who pay just as much insurance as their city counterparts. I will also take it to mean NAB is unable to justify why they won’t help out Roma customers other than the fact that they were unlucky enough to be impacted by floods which did not have as much ‘size and impact’ as the East Australia flood”. I got no response. So I let them have it with both barrels in a story I wrote for tomorrow’s front page. The first sentence read “National Australia Bank’s motto is ‘more give and take less’ but try telling that to fuming Roma customers the bank has abandoned a second time in 12 months.” Wanting to give NAB a chance to respond, I sent them a full copy of the article several hours before my deadline and told them to pass it on to their management. I don’t know if they did or did not but they never responded to me. NAB made cash profits of $4.58 billion last year. I was just the representative of a two-bit hick media outfit in Woop Woop. There was no need to set up a fund for ex-gratia payments for the people I represent. But regional newspapers play a vital role in small towns. As Rod Kirkpatrick points out, since the 19th century a district was lacking an essential weapon in its armoury if it wasn’t represented by a journal of its own. They became advocates and agitators for regional rights and vehicles for political causes. They achieved cohesion and “countrymindedness” for their constituents. Today, many rural papers have been run down by the pressures of running a newsprint business. But the need for cohesion and countrymindedness (if not bloodymindedness) is still as strong as ever. If I as a country journalist, don’t get mad when local citizens are duped by sanctimonious commercial enterprises that are supposed to serve them but instead act like moral pygmies, then who will? An extraordinary week in Queensland politics has ended with Brisbane Mayor Campbell Newman as LNP leader despite not being in parliament. The current leader and his deputy, John-Paul Langbroek and Lawrence Springborg, resigned their positions today leaving Jeff Seeney as “leader of opposition business” in parliament. Newman prompted their resignations by declaring two hours earlier he would stand for the Brisbane seat of Ashgrove held by Climate Change Minister Kate Jones. Newman said if successfully preselected for that seat, he would challenge Langbroek for the leadership. Seeing the writing on the wall, Langbroek fell on his sword. Newman’s elevation to leader-in-waiting as a non-MP is unprecedented in Australian politics. Premier Anna Bligh quickly accused Newman of abandoning the people of Brisbane and she also hinted at an early election. “What I see in Campbell Newman is a man who when his city faced its worst disaster, when families across our suburbs are in shells of homes, Campbell Newman decided to cut and run when people needed him most,” Bligh said. “What I say to the people of Queensland is that I will never cut and run when you need me.”Bligh used the phrase “cut and run” five times in the interview setting the tone for a likely plan of attack during the election. With three year terms in Queensland, the next election is due by 2012. But with mandatory council elections in March 2012, the likelihood was Bligh would go early to avoid any residual taint from the loathed forced council amalgamations of 2007. Tanking in the opinion polls in 2010, Bligh’s stocks rose with the rivers during the 2010-2011 Queensland flood and cyclone crisis with universal praise for her leadership, while Langbroek was perceived to be missing in action. Recent polls show Bligh’s approval rating more than doubled to 60 percent, but also showed the LNP would comfortably win the election with a 55-45 2PP lead. Bligh was preferred premier, but despite the floods it was still looking like a proverbial “drover’s dog election”. The only question would be drover. The internal campaign against Langbroek came to a head earlier this month when MPs complained the organisation had not yet endorsed a sitting MP for the next election. LNP President Bruce McIver claimed this was merely procedural, but MPs were not convinced. One MP told The Courier-Mail the relationship between Langbroek and McIver had deteriorated significantly. Yesterday, Langbroek was reported calling for the faceless men in the party to resign. “Faceless men” has long been a metaphor in Australian politics for those who count the numbers in backrooms, and in this case it was a clear reference to McIver. Labor upped the ante when Treasurer Andrew Fraser said McIver offered an illegal inducement. He asked the Crime and Misconduct Commission to look into suggestions McIver offered Bruce Flegg a top job in London if he quit his seat of Moggill so Newman could be parachuted into state politics. Fraser said it was an offence under section 87 of the Criminal Code to promise a public office holder a favour or benefit. Fraser’s allegation remains to be tested, but it blew apart any hope of Newman taking a safe seat. Hence the announcement today about Ashgrove where Kate Jones won in 2009 with a margin of 7.1 percent. She won’t be easy to unseat. Queensland’s optional preferential voting makes it difficult to predict but Jones can expect a good preference flow. According to Andrew Bartlett today, “the Greens will have a good candidate in Ashgrove who may well also be announced fairly soon”. Bartlett admits it is to Newman’s credit he is not being parachuted into a safe seat. Newman will rely on his own popularity. It has been a while since Newman was Australia’s most senior Liberal (that honour was taken in turn by WA Premier Colin Barnett then Victoria’s Ted Baillieu and next week by NSW’s Barry O’Farrell) but it was always in his blue blood that Brisbane would not be big enough for his ambitions. His mother Jocelyn was a Tasmanian Senator and minister in the first two Howard Governments and his late father Kevin was a Tasmanian MP and a minister in the Fraser Government. Campbell followed Kevin into the army and then into politics. 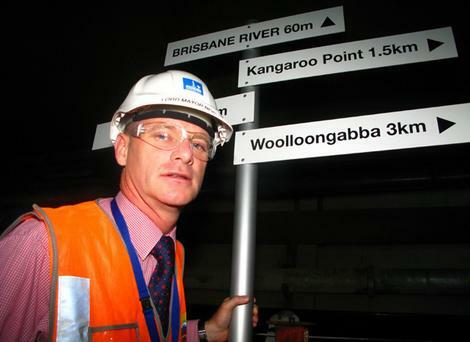 He was elected Brisbane Mayor in 2004 and comfortably retained his position with a big win in 2008. His second win also helped the Liberal win control of council. In December 2010 he finished fifth in a competition to find the best mayor in the world behind Mexico City, Oklahoma City, Riace (Italy) and Surrey (Canada). Testimonials praised his vision, drive and passion. These will be qualities Campbell Newman will need in abundance if he is to steer the LNP to victory in the next election from outside the gates of parliament. Embattled Yemeni president Ali Abdullah Saleh has sacked one of his ministers as the month-long protests against his 32-year rule shows no sign of ending. Hamoud al-Hattar is the scapegoat for failing to find a way to deal with opponents demanding Saleh step down. Protesters in the capital Sana’a are fed up with a lack of democratic reform, widespread corruption and human rights abuses by Saleh, his family and allies. Saleh refuses to step down until his term of office expires in 2013. Yemeni authorities have deported four western journalists over their coverage of the protests. Security forces raided an apartment and arrested two British and two American journalists and kicked them out of the country. They follow the deporting of an American journalist and Italian photographer a day earlier. Briton Oliver Holmes said one of the agents told him they were all being kicked out because of their coverage of the protests. “We have all been reporting on the use of violence by the police,” Holmes told Al Jazeera. The flashpoint has moved to the north eastern Marib province where the governor was stabbed, police opened fire on protesters, and rebels have blown up an important oil pipeline. Marib is a predominantly tribal area implacably opposed to Saleh’s regime. Saleh’s man in the province Governor Naji al-Zaidi was caught up in a large demonstration outside the local government building yesterday. Security troops fired live ammunition and tear gas, injuring around 37 people. A group of men stabbed al-Zaidi and four bodyguards with daggers before he was flown by helicopter to a military hospital in the capital.Tribal fighters sabotaged an oil pipeline this morning and cut the road between the Marib’s gas fields and the capital. Local police said the pipeline connecting Marib’s oil fields to the Red Sea was ablaze and the main road between Sanaa and Safer was cut off disrupting tanker traffic and jeopardising gas supplies to the capital. There have been grumblings in the Arab world’s poorest country for several years over Saleh’s autocratic regime and the likelihood of an eventual transfer of power to his son Ahmed Saleh. His troubles are compounded by an insurgency by Houthi rebels in the north, a separatist movement in the south and a large Al Qaeda threat. It took January’s Tunisian revolution to galvanise the opposition into action. 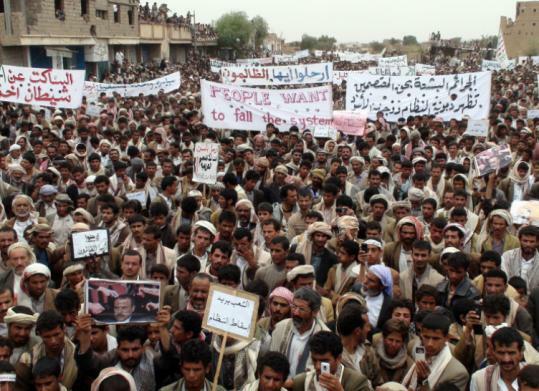 Large street protests flooded the capital and Saleh offered reforms including presidential term limits and voter registration. The opposition and protesters rejected the proposals saying the reforms did not ensure that Saleh could not run again. Emboldened by success in Tunisia and the overthrow of Hosni Mubarak in Egypt, protesters held a “day of rage” in early February. Unlike Egypt, the 20,000 strong Yemeni protest ended peacefully, though Saleh did make efforts to stifle them and his forces shot dead protesters in Aden. Protests continued through the month, gradually increasing in size and scope. Yemeni soldiers fired artillery at anti-government protesters in the northern village of Semla in Amran, killing two and wounding seven. Where the protests have been most successful is in bringing Yemen’s deeply fractured opposition movements together. In the last election in 2006, Saleh’s ruling General People’s Congress took 76 percent of the vote with the umbrella group Joint Meeting Parties taking 21 percent. The JMP has united with the tribal and Islamist Islah party bringing most of the anti-Saleh forces under one banner. The Hashid tribal confederation and Houthi rebellion forces remain outside the tent and it would be unclear what role if any they would have in any post-Saleh government. It is likely secessionist movements will continue to agitate regardless of who reigns in Sana’a. 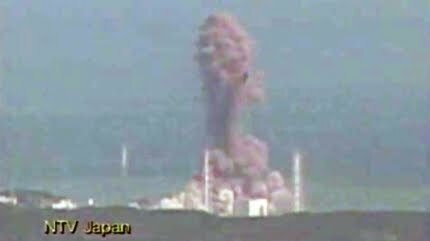 With Fukushima No 1, 2 and now 3 plant on the verge of meltdown now might not be a good time to be advocating nuclear power. Yet I am coming to the conclusion environmentalists like Lovelock are right. If we don’t go nuclear, we are toast. When scientists have good data that says the planet’s temperatures are heading into unknown territory and we don’t seem to want to change our ways, then at the very least we should have a good Plan B. Despite the longer-term potential of solar and wind power, nuclear power is the best proven Plan B we currently have. As Japan is proving, nuclear fission is a flawed technology. Yet Chernobyl aside, it has killed only a handful of people since the 1950s despite providing 15 percent of the world’s electricity and 6 percent of the world’s energy. Ever since the CND and Greenham Common, nuclear power has been an emotional talisman for the green movement. Opposition to it is one of its fundamentals and an almost taboo subject of discussion. The Greens, who in Australia are the most steadfast voices for recognising the problem of climate change, refuse to acknowledge the single most advanced technology we have for solving it in the short term. Reams of climate data tell us severe consequences are coming in the next 50 years if we don’t lower emissions. Green technologies are not quite ready to fix the problem. Protectionism of fossil fuel technologies hasn’t helped but the best evidence is we are 50 years away from renewable sources providing base load electricity that supports our current lifestyle. Renewable power stations will also be just as expensive and will face the same NIMBY issues as nuclear ones do. Rebellion against that lifestyle motivates many Greens. But most humans, a majority of Greens included, are not yet prepared to give away improvements like cheap international travel, internet access, or private transport. Short of human catastrophe directly attributable to global warming, change will be slow as the history of climate change international negotiation shows. Nuclear power is a way of confronting this problem, now. As Crikey editorialised today, the expense of setting up nuclear power is the biggest issue. Nuclear power has nothing to do with morality. What is moral or ought to be, is consistency in uranium and waste policy. Issues creating nuclear power and disposing after effects could be resolved with the proceeds of a carbon tax. The Liberals would be the obvious candidate to suggest this possibility, but their implacable opposition to the tax means no one dares suggest that publicly. Labor is just as equivocal and their party website studiously avoids policy discussion on the subject. Only party extremists on either end such as Martin Ferguson and Peter Garrett could claim to have a coherent policy on nuclear power. Those in the middle equivocate according to the arguments du jour. Regardless of what The Australian thinks, the Greens have been a positive force in politics. It’s never a popular position to stand up as a Cassandra and warn of the problem if we don’t change our ways. For this reason, the Greens will never be popular enough to form Government in their own right without significantly ditching many core parts of their agenda. Their ideological purity allows them to carry most ideas through to logical conclusions without compromise. It’s no surprise to find they are the most inherently coherent party on most aspects of the conversion to a green economy. Yet there is one blind spot to their argument. The near religious hold “no nuclear power” has on the green movement means we are considerably weakening our options to deal with the problems. The Australian right only seriously considers nuclear power as a wedge to taunt Labor. The three major parties perpetuate the fiction Australian is not a nuclear power despite its uranium exports, Lucas Heights and the likelihood of nukes at Pine Gap and visiting American warships. The Australian Greens’ policy is a monument to pious thinking and not a solution to real world problems. The Greens have five principals that deal with nuclear power. This is a weak first principle. It seeks to show people can’t be trusted with nuclear power. As alcohol prohibitionists found out, banning something is not the way to stop it. Much of this is a repeat of the first principle. The rest is hyperbole. Nuclear weapons haven’t been used in war since 1945 though many times as exercises (see Japanese artist Isao Hashimoto’s 14 minute timelapse of all 2053 nuclear explosion between 1945 and 1998). There have been a few catastrophic accidents. But no deaths or serious injuries have ever been attributed to radiation from a Western civil nuclear power plant. Three Mile Island is one of only two meltdowns in the US (Fermi 1 was the other) and neither suffered loss of life. The IAEA’s International Nuclear Event Scale goes from 0 (no safety issues) to 7 (major accident). The 1986 failure of Reactor 4 at Prypiat, Ukraine, better known as the Chernobyl Disaster is the only INES 7 accident yet recorded with 4,000 deaths caused directly or indirectly by the incident. This was a tragedy of the first rank but it says more about Soviet industry standards than it does about nuclear power. Other power sources in Russia are just as vulnerable. In the 1999 disaster at the largest hydroelectric power station in the country Sayano-Shuskensky in southern Russia seven people died. If the 240m dam had collapsed, hundreds of thousands in the cities below the dam would also have been in jeopardy. Yet the Greens don’t want to ban hydroelectrical power because of possible accidents. The third part of that second policy principal deals with terrorist actions, which remains a threat. But again, banning something simply because terrorists use it, is not a problem limited to nuclear power. 3. “Future generations must not be burdened with high level radioactive waste.” This is a noble gesture but what is the extent of the burden? Waste comes from both the front and back end of the nuclear process. The front end waste, depleted uranium, is used in highly destructive weapons but it also has practical applications such as in the keel of yachts. The back end waste, spent fuel rods, is the heavy hitting stuff. The amount of High Level Waste worldwide is increasing by 12,000 metric tons a year, which nuclear power company Marathon Resourcing says is the equivalent to 100 double-decker buses. 4. “Nuclear power is not a safe, clean, timely, economic or practical solution to reducing global greenhouse gas emissions”. The fear factor of safety returns again. How safe is not addressing global emissions by use of nuclear power? The word “clean” is a platitude presented without any evidence. “Timely” is questionable but has some merit. A nuclear power plant would take 12-15 years to commission and build. They are expensive but so will be any solution that envisages humans keeping energy usage-intensive lifestyles. As for nuclear being not a “practical solution”, go ask any of the world’s 440 commercial nuclear power stations in 30 countries, even those ones built on geological faultlines. This final argument has nothing to do with nuclear power. Australia’s ANZUS agreement lends our bases to US nuclear war fighting apparatus regardless of nuclear power policy. These five principals are not wrong individually. But they are weak arguments given the cards we’ve been dealt with. Longer term, renewable energy is easily the most sensible solution. But until we overcome the variability of solar and wind power production, land area required, and the NIMBY fights to get there, nuclear power is the best proven technology to achieve base and peak load in an emission-free way. Nuclear reactors will never kill as many people as a nature’s earthquakes or tsunami, they just need to be built better on the Pacific Rim. US capital has won a major battle in the war against labour in the state of Wisconsin. A bill to bust the power of the state’s public workers unions was set for approval on Thursday US time after Republicans lawmakers pulled a fast one. With Democrats deliberately out of the state, the Republican could not get a quorum to pass a budget bill. So they stripped references to the budget from the bill, which allowed it to pass without the legislative quorum needed for fiscal measures. Republican Governor Scott Walker said passing the bill will give them the tools to reward productive workers and improve their operations. Unions disagree and have maintained large protests in the capital for three and a half weeks. Wisconsin had a $3.6 billion budget shortfall for 2011. Walker wants to solve the problem by lowering public sector workers’ salary and ending their collective bargaining rights. NBC’s John Bailey said the deficit would blow out to $1.3 billion by 2013 blaming falling tax revenues allied to rising unemployment putting pressure on the public purse. Tax cuts since 2003 have accumulated to $3.7 billion in lost income, though it is harder to estimate whether they have had positive effect. Walker was keener to balance the books with cuts rather than taxes. He claimed the alternative was worse: laying off 6,000 state workers, and taking away Medicaid coverage for hundreds of thousands of children. The unions agreed to the pay cuts but refused to give away their rights. Walker said that wouldn’t work for the organisations funded by the state. Collective bargaining, he said, stood in the way of local governments and school districts being able to balance their budget. “My goal all along has been to give these folks tools to control their own budgets. You’ve got to give them some flexibility.”Wisconsin is normally a safe pro-labour state that has voted Democrat in the last six presidential elections. It swung viciously to the Republicans in the 2010 midterms as the recession shattered consumer confidence. The GOP won a Senate seat and control of the House of Reps. They also gained the governorship as Scott Walker ended a Democrat eight year reign when Governor Jim Doyle retired. On Valentine’s Day, Walker made another bold statement when he romanced the Committee on Senate organisation to introduce Senate Bill 11. This budget repair bill requires state workers pay additional direct pension and health insurance contributions and removes collective bargaining rights except for wages, which is limited to CPI. The bill also included provisions to empower the state to sell government infrastructure on a no-bid basis without Public Service Commission oversight. Koch Industries, a major contributor to Walker’s election campaign are the likely beneficiaries of this looser arrangement and could potentially snap up Wisconsin power plants at bargain basement prices. Union leaders began pressing lawmakers to reject the idea. This was personal – Wisconsin was the first state to provide collective bargaining rights to public employees over 50 years ago in 1959. 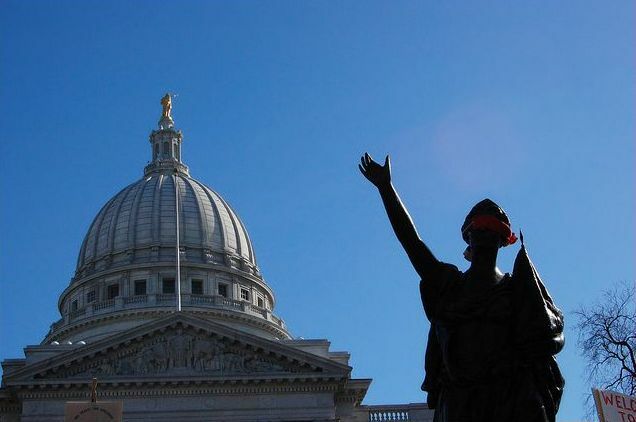 Rallies started in the state capital Madison on the same day the legislated was released. Within three days, they were getting 70,000 people and visits from Jesse Jackson. There was talk the protests would energise the Democrat base. On 20 February they occupied the Capitol. By 3 March police were opening fire outside the building. Walker threatened to get the National Guard out to “handle state duties”. The Governor said he would also dismiss 1,500 workers this week if the billed is not passed soon. Democrats have taken evasive action to delay it. Minority leader Mark Miller and his colleagues went to Illinois to avoid taking part in a vote. Until they return, there is no quorum and the measure cannot be passed. In revenge, the Republicans suspended direct debit payments forcing them to pick up pay cheques in person. They have been docked $100 for every day they stay away, their parking spaces seized and their secretaries fired. A blogger named Buffalo Beast pretending to be David Koch caught out Walker into admitting he was ratcheting up his actions every day.